In a large bowl, combine all the quiche ingredients together to form a smooth mixture. Pour the mixture into greased, disposable foil moulds. Position on a tray with high sides and oven cook in a bain-marie at 150°C for approximately 15 minutes. Blanch the asparagus in boiling water and then sear in a pan with strips of the guanciale. 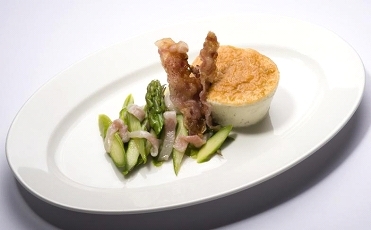 To serve, place the Squacquerone quiche in the centre of the plate and garnish with the seared asparagus and guanciale. Squacquerone Quiche with Pan-fried Asparagus and Guanciale is one of the many recipes using the wonderful foods that you can find in the Emilia Romagna region of Italy. These range from the delicate prosciutto of Parma to the distinct balsamic vinegar of Modena, but cheese is where this region really shines.